CRAPTASTIC: Five Feature Friday #3 and Thanks! I survived finals week! I am officially D-O-N-E with my didactic phase, and on August 15th I start my first clinical rotation. I'll be doing a pediatric rotation in Chattanooga! Children are WAY more intimidating to me than adults, so this should be interesting!! I saw so many awesome ideas this week! Here are my faves! This craft room makeover by Kait @ Mrs. DIY and the tennis guy is drool-worthy! 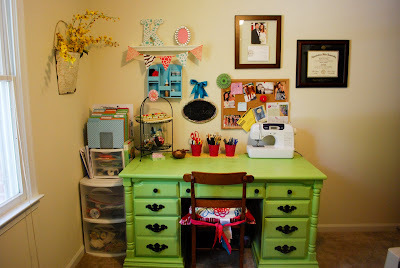 I love the colors, and look at that gorgeous green desk! This is my kinda craft room! Michele @ Shelstring made this awesome outdoor bench using scrap wood and logs! Ummm, yes please! I love this!! I'll have to keep my eye out for some free wood! I love purple, people!! 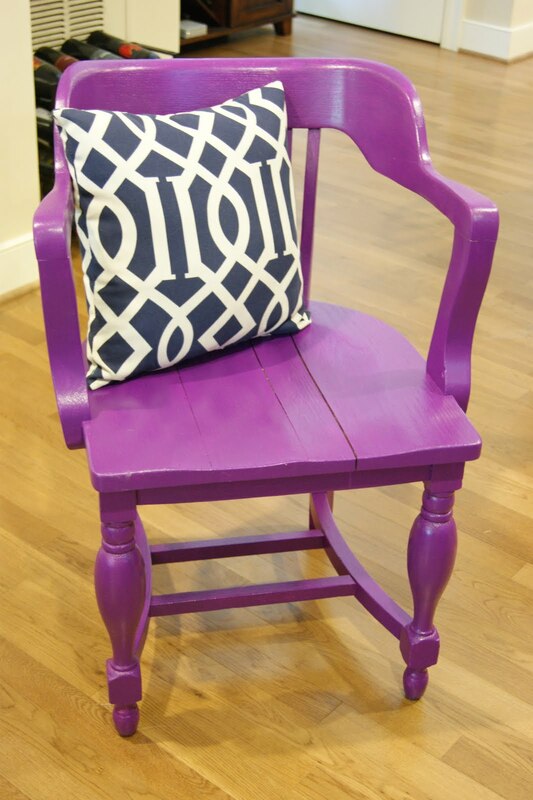 Kate from Dream To Life made over this sweet antique chair! I'm a big fan of chunky legs and old wood! Kate did a great job! 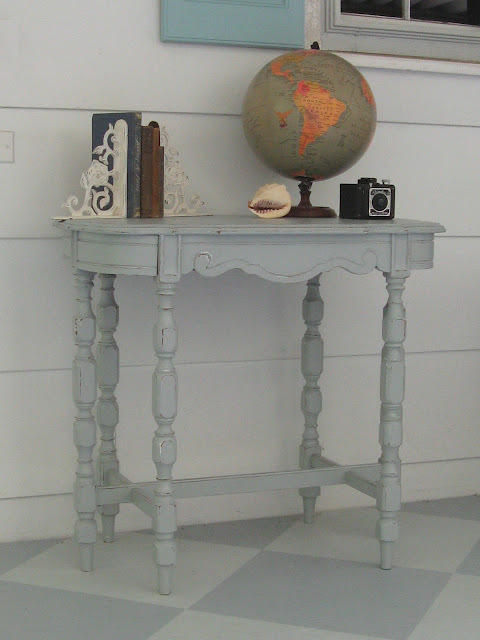 I'm totally digging this sweet table makeover by Carrie at Lovely etc. It looks so sweet in it's new grey paint! This style of table is adorable! And do you SEE the floor! Mercy! How gorgeous is this mirror makeover from Maria at Our Lake Life?! What a gorgeous, ornate mirror! Perfect color too! I wanted to give a quick shout out to Jess @ A Few of My Favorite Things and Kate @ Posh Patina! I won a giveaway and got to pick out any piece of jewelry I wanted! I chose these gorgeous Rustic Verdigris Patina Flower Filigrees earrings! They're precious and I can't wait to wear them! Don't you love her handwriting! Everything in Kate's shop is less than $10! Check her out! I hope you all have a great weekend! I've been busy getting all my projects started! I hope to have some for you soon! Fabulous features. I love the bench too. My husband made one after I saw a rustic one in a park. That bench is awesome, and I like the purple chair..a lot! Congrats on getting through finals Katie! I'm sure the kids will love you and you'll do a great job! Thanks for the shout out! I am so glad you won! love that floor, mercy is right!! everything is beatiful in it's own way. great picks! thanks so much for your sweet comment on my turquoise birds :) just came to check out your blog; i love it! i am your newest follower! Great finds :) One piece of advice with kids (teacher for 13 years now)-candy in pocket is always a good fall-back. What great features! That turquoise mirror is gorgeous and I love the sweet little gray table. I LOVE that purple chair! My husband would freak if I had that in a room though, haha. Too bad because I am a purple-finatic! I LOVE LOVE LOVE your paint colors!!! Great job as always!!! 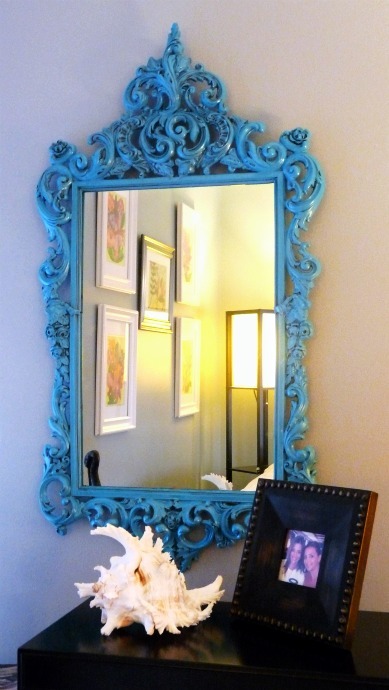 Oh your blog is so fun, Thanks for stopping by my site and for featuring my Turquoise Mirror.